Exceeding the 20kg luggage limit? 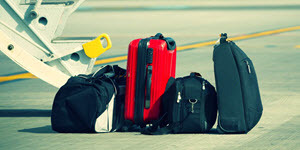 PACK & SEND provide a great alternative to excess luggage expenses. If you find yourself with excess luggage that exceeds weight limits or size restrictions, we offer a cheap and easy shipping alternative. PACK & SEND offer cheap excess baggage shipping interstate and worldwide. Comparing our services and prices to commercial airline offerings, you can see why many choose PACK & SEND to get their excess luggage home safely. No matter where you need to send your excess luggage, the professional team at PACK & SEND will find the cheapest and safest option for you. Both excess domestic baggage and international excess baggage delivery offer peace of mind with our expert courier team and our track and trace service, keeping you informed along the way. Drop your excess luggage at a Service Centre or get a convenient door-to-door excess baggage service. We offer the best way to send excess baggage overseas and domestically!